Back in 2016, FCA introduced the Ram 1500 Rebel TRX Concept, packing a unique version of the supercharged Hellcat Hemi. That gorgeous concept truck has continued to make the auto show rounds with tremendous fanfare as Mopar fans see this as the truck that would beat the Ford F150 Raptor. Inside information suggests that a Hellcat-powered Ram 1500 has continued to be discussed internally at FCA, meaning that there is still a possibility that this supercharged super-truck could become a production reality. However, there has never been anything to prove that Ram was considering a Hellcat-powered pickup – until now. Discovered by our friends at Allpar, within the images of the all-new Ram 1500 provided to the media by FCA, there is a picture of the new half-ton pickup’s infotainment screen in the sporty Rebel models. On that screen, the time listed is 7:07. Many people believe that this is a clear hint that the Rebel TRX with Hellcat power could be on its way to the lineup. There is still no official word from FCA or the Ram brand on this topic, the arrival of the Jeep Grand Cherokee Trackhawk makes a Hellcat Ram more likely than it has been in the past. You might be wondering why the arrival of the Jeep Grand Cherokee Trackhawk has any impact on the future of a Hellcat Ram. The biggest shortcoming with the Hellcat-powered Dodge Challenger and Charger is traction. If Ram were to put the same basic drivetrain as the Dodge Hellcat cars in a Ram 1500, with 707 horsepower being channeled to the rear wheels, the supercharged pickup would be even more traction-limited. Even with big, fat tires, a rear-wheel drive Hellcat Ram would make for some traction nightmares. Of course, if the Hellcat-powered Ram does go after the Raptor, the 4x4 system would be an absolute requirement. The Jeep Grand Cherokee Trackhawk also has the 707-horsepower supercharged Hemi, but the SUV benefits from a standard four wheel drive system that makes it a road-gripping beast. The Hellcat Ram would need four-wheel drive and with the Trackhawk, FCA has a high performance 4x4 system in their arsenal that they know can handle the torque of the supercharged Hemi. The truck would be slightly heavier and a bit bigger, so there would need to be some tweaks to the driveline, but FCA has the components to make a Hellcat Ram happen. 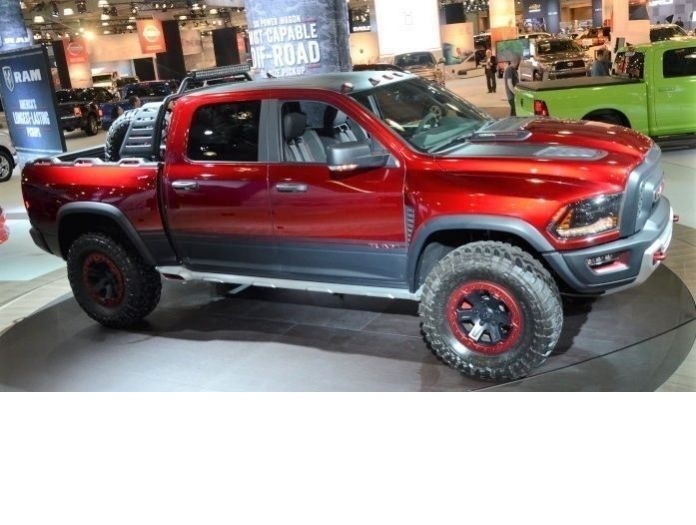 While I love the look of the Ram 1500 Rebel TRX and I see the business case behind building a proper competitor to the Ford F150 Raptor, I personally would prefer to see a modern take on the old Dodge Ram 1500 SRT10. That on-road performance truck was a rear-drive model with the V10 from the Dodge Viper and at its time, it was the strongest and fastest pickup truck in the world. The jump to the bigger power of the Hellcat Hemi would likely require a four-wheel drive system, even if it was an on-road pickup, but just imagine a regular cab Ram 1500 with what is basically the exact same drivetrain from the Trackhawk. It would be the greatest on-road performance truck in the history of the auto industry. Really, this dream of an on-road Hellcat Ram is probably a pipe dream with the popularity of the Rebel TRX Concept, but in any case, the likelihood of a Hellcat-powered Ram truck seems better now that it has ever been in the past. Would love to order one TRX! Something tells me they won’t unless ford comes out with something. I can't see it having a large price tag I could see around 80k An that's well in the range basically a power wagon with a real power plant how much more could it really be.